It's better than having nothing off. Code just worked for me, got 5% off my order. Discount applies to menswear and footwear, excludes outlet, electrical, large appliances and technology. Delivery will be deducted as a £3.50 money off after checkout. 'Not yet available' for me either.. Currently coming up as "The Promotional Code 'QCYA3' is not yet available." As Jacamo deals don't seem to be posted much I'm voting hot but as peter1969uk said they regularly email discount codes with free postage. Get the year delivery pass for £9.95. Free all year then. Sorry, I've voted cold. I'm always getting these free postage deals from them. Usually with a percentage off goods too. Excludes Outlet. Enter the code at the checkout to receive the Discount. Tried to use. Didn't work. Says it's expired. Hi I'm New to this website! How do I get the code for Jacamo please? This is a good deal. Thanks for sharing. Code only sent to me yesterday but you're right says expired, AXXJ1 can be added to bag, taken 25% + free delivery off my basket. 25% off	Jacamo 25% off + free delivery! Worked perfectly for existing customer. Thank you. You Must sign in or Register to get the discount. 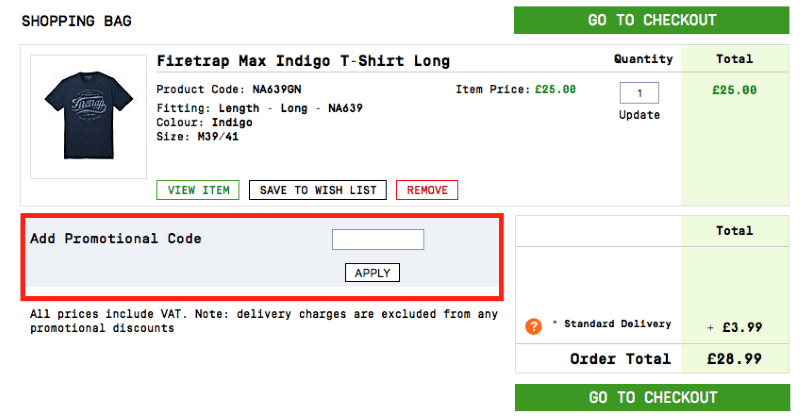 Look out for the OUTLET and OFFERS sections too - seems to be 4 x £15 shirts for £32 delivered. Strange you need to sign up first before you can apply the code (so I didn't). Code isn't applying for me? EDIT: Got it working. Just had to add more items. Might want to add there is a minimum of £40 spend. Enter the code at the checkout to get 20% off you must register or sign in before this code will work. Worked great thanks. Free Delivery too. INSTRUCTIONS: I got this code through the post today. I've ordered from them before and the code may not work for all. This still works - saved £56 on my order - valid until Sep 2017! This still works - just saved myself £156 on an order! Thanks OP. The 30% off code just worked for me. I got 2 pairs of own brand hi-top trainers for £21 delivered. Try WYLJ7 20% off &amp; free delivery. Hmmm says my account is not eligible for this offer? Just worked for me (27th Nov). Many thanks OP. The Promotional Code 'lujx5' has expired. INSTRUCTIONS: Enter the code at the checkout. Ends Midnight !!!!! INSTRUCTIONS: Register or Sign in and you can get an Extra 10% off by entering the code at the checkout. INSTRUCTIONS: Discount code can only be used once per account I think. To be honest I used Quidco because I haven't had time to sign up to topcashback, they give less cashback though at 10% rather than the 10.6% on this Jacamo deal. You basically just sign up the website. Then you search the name of the company and see if they have any offers going. You then click on the button to take to the website, it should open the site in a new tab. I usually go back to the Quidco tab to make sure there's a pop up saying that the website has been tracked. And then go back to the shop website and you just use the website as usual, you should get a notification from the website within a day saying your purchase is tracked. And then it's just a waiting game until the money shows up on your Quidco account. Cheers OP! Worked for me just ordered some things. Didn't work for me but amusingly I had a "new customer discount" of 10% sat waiting to be used, odd as I've bought from them many times. Just found it in time, saved myself £10 thanks! Expired code again from your site without stating it!!!!!!!!!!!! 20% off	Jacamo 20% off and free delivery. TODAY ONLY.